The earlier you put your money to work, the more it earns for you. The earlier you invest, the earlier your money starts working for you. 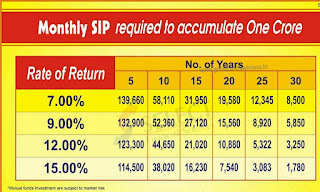 So, instead of investing more money later in your life, invest small now to achieve the same desired target corpus. You may feel that few months will not matter much. How wrong you are!!! Even a small delay will have a huge cascading effect on your returms. 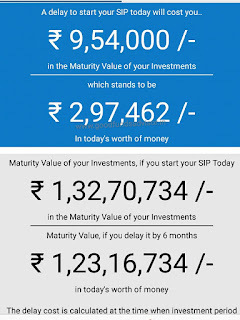 A dealy of just 6 months will result in a loss of nearly 10 lakhs !! 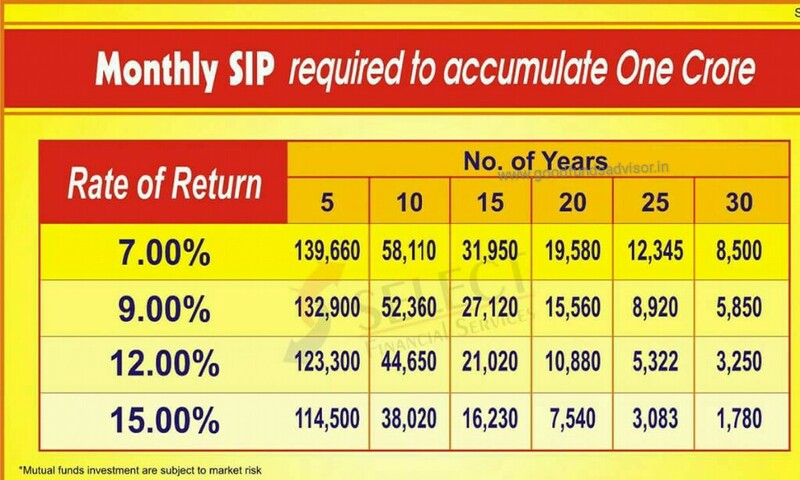 Also note that if you invest Rs.10,000 per month in MF at expected 15% CAGR. In 15 years,it will be Rs. 61 lacs. In 20 years,it will be Rs. 1.32 crore. In 25 year, it will be Rs 2.65 crore. In 30 years, it will be Rs 5.63 crore. In 35 years, it will be Rs 11.41 crore. You can see, every delay of 5 Years, it will make your corpus half of its value. I have seen many youngsters say "I will start next week". Saying to yourself “I will start next week” is nothing less than a disaster. This next week could well next fortnight, next month, next quarter and even next year. 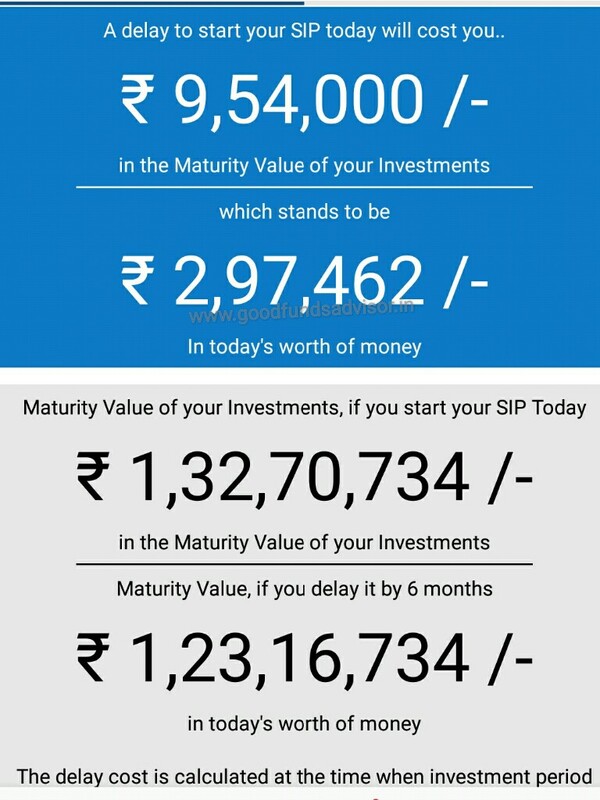 Time flies and the amount you need to invest will only increase. The hard truth is you just can’t afford to delay. 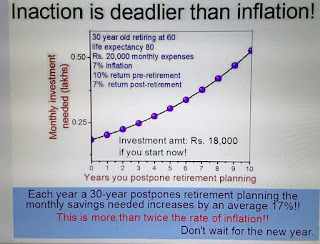 The cost of delaying your savings/investment is deadlier than even inflation. Delaying exercising hurts building health. 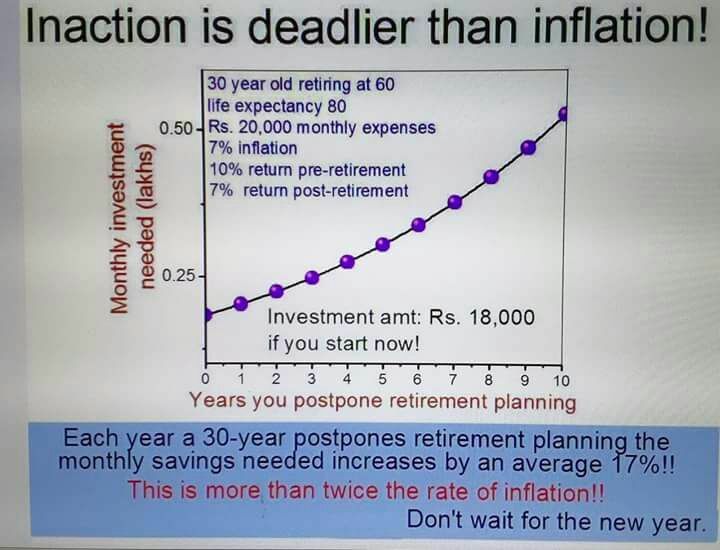 Delaying investing hurts creating wealth. 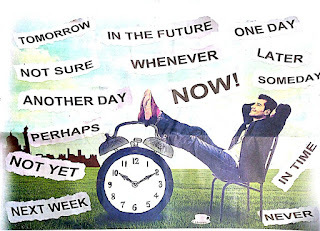 "The best time to invest was 30 years ago, second best time is today." Even compensating for the delayed investment will be a herculean task.